This fine western opens with Van Heflinas a rancher whose family is suffering from the devastating effects of a long drought. Heflin needs $200 to build a well, then learns he can obtain the money as a reward for delivering Glenn Ford, a notorious outlaw now in the hands of the law, to the state prison in Yuma, Arizona. Though this will put Heflin in great personal danger, the peaceful man accepts the assignment, knowing what the money will mean to his family. 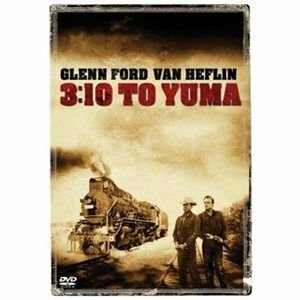 Heflin and Ford hole up in a small hotel in another town while waiting for the train to Yuma. The outlaw begins toying with Heflin's mind, talking in a friendly manner about Heflin's job and financial situation. Playing psychological games, Ford tries to convince Heflin to take $100,000 to look the other way while he escapes. Heflin finds himself in a quandary, desperately needing the money yet being bound by his word to carry out the job. Ford's gang, led by Jaeckel, discovers where their leader is hidden and sets out to rescue him. The town officials abandon Heflin rather than put themselves in danger, leaving the troubled rancher alone to face off with the outlaws. Ford ends up assisting Heflin, helping his captor on the 3:10 to Yuma, explaining, "I owed you that." Heflin has come through the ordeal, body and integrityintact, and, as if in answer to this baptism by fire, the skies burst forth with rain, putting an end to the drought.